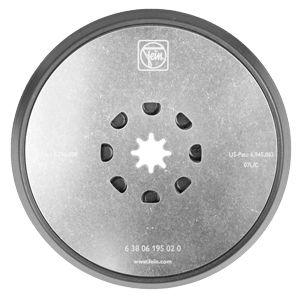 Only the Universal E-Cut saw blade 1-3/4"
The high performance, universal system for interior construction and renovation with accessories for a wide range of applications. Self-supporting motor with vibration decoupling for outstanding vibration and noise reduction. Very powerful 350 Watt FEIN high-performance motor for optimal cutting speeds and maximum work progress. Highest quality and stability thanks to metal gear case and consistent use of ball or needle bearings. Electronic speed control with tacho generator for constant speed, even under load. Integrated interface for mounting additional system accessories. Softgrip zone provides optimal handling. 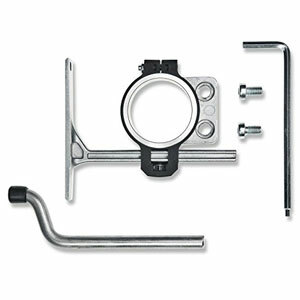 StarlockPlus tool mount with outstanding torque transfer, fits all Starlock and StarlockPlus accessories. Sanding pad, corner to corner:	3-1/8"
1 ea. Universal E-Cut saw blade 1-3/4"
The high performance, universal system for interior construction and renovation with comprehensive accessories for unrivaled versatility. 1 ea. 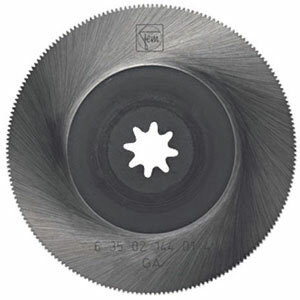 E-Cut Long-Life saw blade 1-3/8"
1 ea. 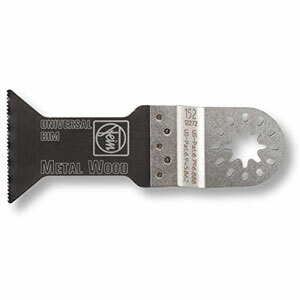 E-Cut Long-Life saw blade 2-9/16"
Fein 63903167399 MulltiMaster Profkit Tile Blades for Fein MultiMaster are used exclusively on the Fein MultiMaster, the original in oscillation tools from a company with over 150 years of experience in power tools. This kit includes all the accessories you need to make your kitchen and bathroom renovation jobs easier. 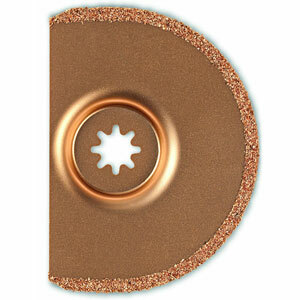 If cutting door jambs or plunge cutting into a floor board we give you the 2-1/2" 134 E-Cut blade. 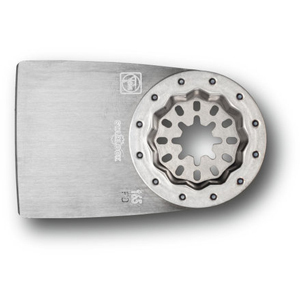 For cutting cooper pipes and fittings the uniquely designed 151 E-cut blade is the right choice for you. Also included in this one of a kind multi pack kit, 3 grout removal blades for the various thicknesses of grout lines that you will run across on your renovation. 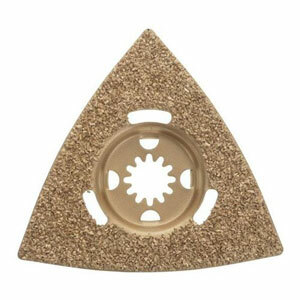 Lastly we also give you a flexible scraper blade for removing glued down carpet and linolium floors. In addition it is perfect for scraping paint off any surface. This is a great kit that will save you time and money because the Fein MultiMaster with its patented quick change system and High Powered motor will cut down work time on many renovation jobs. Fein is the first power tool company in the world and invented the electric power tool in 1895. Get Into Tight Spots, Achieve Faster Results. The flush-cut design of E-Cut blades let you place the blades flat on surfaces perpendicular to the cut. E-Cut Blades increase the cutting speed on the MultiMaster. Cut almost as fast as a jigsaw or reciprocating saw with precision. Set teeth for all woods, plasterboard and plastic materials, very clean cuts and good cutting speed. Wide shape for maximum cutting performance and long straight cuts. The flush-cut design of the Precision E-cut blades lets you place the blades flat on surfaces perpendicular to the cut to easily reach into tight areas that other saws can't. Finish faster. 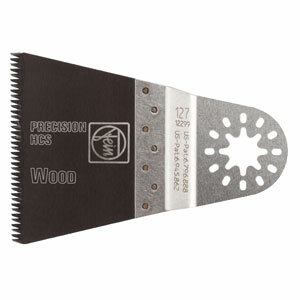 The Precision E-cut blade increases the cutting speed of the Multimaster when using it as a saw. Cut almost as fast as a jigsaw or reciprocating saw without sacrficing precision. Great for woodworkers, remodelers and contractors. 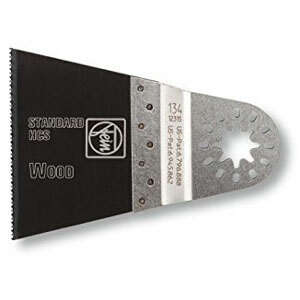 EZ-cut blades are designed for wood, plaster, drywall and other soft materials. They can be used by tile/flooring installers and window installers as well. Bimetal with wavy universal toothing. Broad application spectrum for sheet metal up to 5/64 in [2 mm], aluminum profile, copper pipes, wood, plasterboard and plastics. 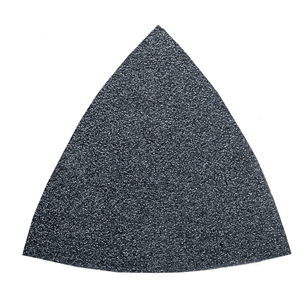 Wide, waisted shape for optimal cutting speed and good swarf removal. 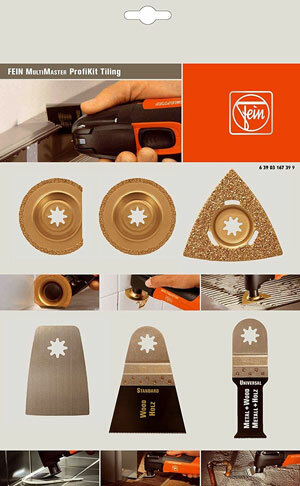 This is a Fein 3 -1/8" HSS Segmented Cutting Blade. 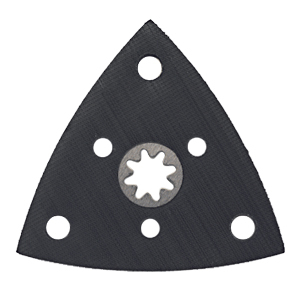 This is a High Speed Steel saw blade with segmentation on one side. The High Speed Steel material is more rigid allowing the blade to cut through sheet metal up to 1.0 mm thick as well as harder wood, carbon fiber, fiberglass, and nails. The segmentation enables cuts to be made at right angles without over cutting. This is a Fein 3 -1/8" HSS Flush Cut Saw Blade. This Blade is designed to cut harder material and last longer. 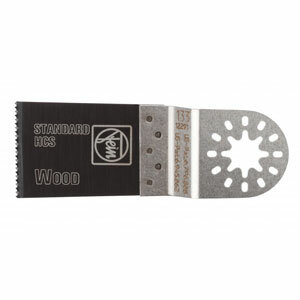 High speed steel blade for cutting wood, fiberglass and steel up to 16 gage flush with the surface. 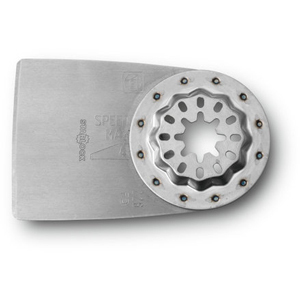 The smaller size can cut in tight spots where other blades cant. The blade has a depressed center to cut squarely against flat surfaces. These blades cut by oscillation, only a few teeth do the cutting. MultiMaster Carbide Rasp. 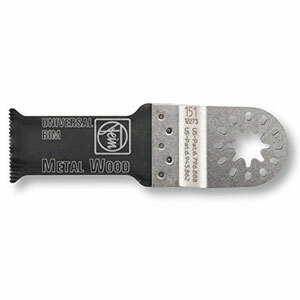 The carbide rasp is an aggressive sanding head bonded with silicon carbide for the MultiMate tool. 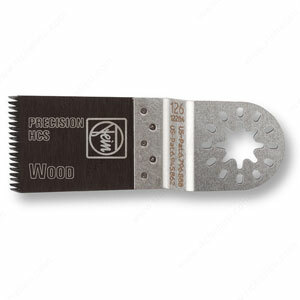 The silicon carbide bonding helps in sanding of thin set behind tile as well as stripping on wood. 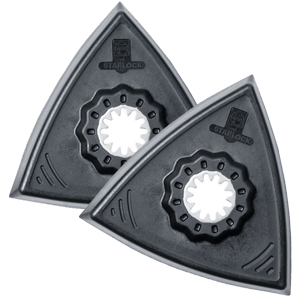 The carbide rasp is cleanable for reuse when it gets overloaded. This makes the rasp last for a longer time. 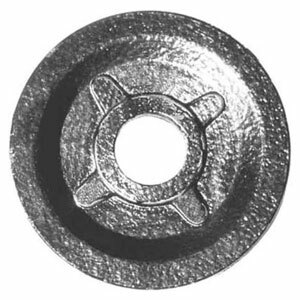 Depth stop for all saw blades. For exact, deep work. 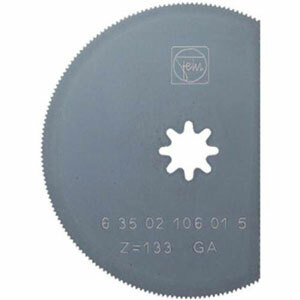 Effective saw blade and workpiece protection. Contents: 1 adapter for attachment to the machine, rotates 360°. 1 depth stop, 1 adjustable depth guide. Only usable with (A)FMM or (A)FSC. The Fein Flexible Scraper Blade removes paint, carpet adhesive, flexible caulking and label adhesive. This scraper blade is ideal anywhere a putty knife might be used. It easily scrapes paint, undercoating and old wallpaper, lifts linoleum and removes caulking. This flexible blade removes glued carpeting faster, safer, and easier than other tools; the oscillation does all the work. 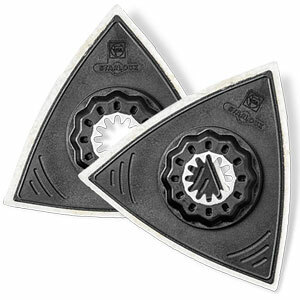 The flexible scraper blades comes in a pack of 2. 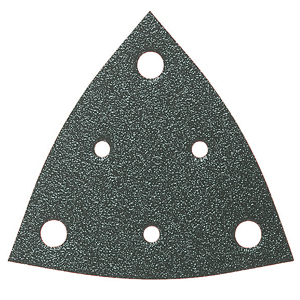 This is a rigid scraper blade for the Multimaster tool. This blade can be used any time you would normally use a putty knife for removing paint, linoleum flooring, and even carpeting in smaller areas. The blade can be re-sharpened for longer life. This blade also works very well for removing window putty. The Profile Kit is a sanding kit for the FEIN MultiMaster. It allows the FEIN MultiMaster to sand various profiles that are found on furniture, moldings or stairways. It sands up to 3 times faster than conventional sanders, and is virtually vibration free. It includes 6 different profiles, the adaptor to all FEIN MultiMasters, and 15 sheets of paper. 5 sanding sheets grit 80, 120, and 180. For sanding with dust extractor. For universal application on nearly all surfaces. Corundum abrasive grain and full resin bond guarantee high abrasion performance. From grain 36 to 280. 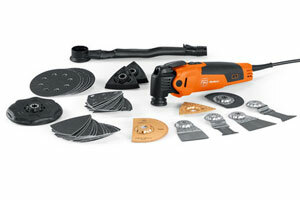 For sanding with Fein MultiMaster with Dust Extractor. The new STARLOCK and STARLOCK-PLUS multi-tool accessories from Fein, combine the latest materials and designs making the best multi-tool accessories, even better. Both have a stainless steal mount and improved geometry that transfers more energy through the accessory to your work piece/material. This in turn improves your speed and accuracy of cuts. STARLOCK accessories are compatible with All Fein Multi-Talent and MultiMasters. They will also fit virtually any other manufacturer. For polishing metal parts, as well as polishing and decorative polishing of stone and stone products. Gelcoat layers on boats can also be polished. Plastic carrier plate to prevent damage and marks on the workpiece. Material-specific polishing products are available from specialized dealers. Use with the hook & loop 4-1/2" pad. 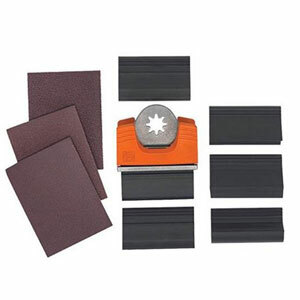 4-1/2" sanding pad for the professional sanding of medium sized flat surfaces. 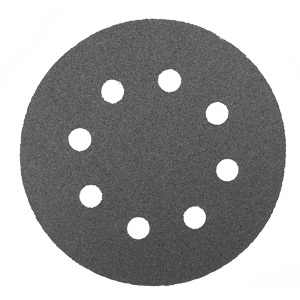 Perforated for dust extraction, resin bonded for high material removal performance, hook and loop attachment. The Fein Star-Mount Adaptor allows you to mount the newer star-mount accessories on your older-model round arbor MultiMaster.